Avery was the kind of player who could do it all on the ballfield, as described by the Morning Herald on May 27, 1937. “GHS Pitcher Allows Only Seven Hits, Fans 10 and Has Perfect Day at Bat in Five Trips to Plate,” announced the sports page headline. “The Red and White moundsman fanned 10 batters and allowed only 7 hits [and] besides pitching a good game, turned in a good day at bat with five hits in as many trips to the plate. He was calm and cool headed on the mound and twice got out of bad situations with three men on, fanning the next three batters. By 1940, Avery was attending the University of Alabama, where he played baseball, basketball and football, and was playing semi-pro summer ball in Gloversville with Shermans’, the Johnstown Indians and the Bleecker Dutchmen. He missed out on going to the Cotton Bowl with the Crimson Tide in 1941 (where they beat Texas A & M under head coach Frank Thomas) because of a toe fracture, but was back with the team the following year. With war looming, Bartle took military studies at Alabama. He married college sweetheart Ellen Daniel on November 12, 1943 at Trinity Church, Gloversville, and entered military service days later. After completing basic training he was assigned to Infantry Officer’s Candidate School at Fort Benning, Georgia, and graduated as a second lieutenant in April 1944. From there he was assigned to Camp Claiborne, Louisiana, and it at Claiborne in June 1944 that he received news of his older brother’s death. Second Lieutenant Milton Avery lost his life with the 15th Air Force in Italy. By November 1944, Bart Avery was serving in Europe with the 335th Infantry Regiment, 84th “Railsplitters” Infantry Division, attached to the 9th Army. His wife, Ellen, gave birth to a baby daughter on Christmas Day, but Avery’s time was occupied with action at the Siegfried Line in the Geilenkirchen sector, the Battle of the Ardennes, the Roer River crossing and the breakthrough to the Rhine. Perhaps inspired by the loss of his brother, Lieutenant Avery quickly established himself as battlefield hero. On November 30, 1944, he made five different trips with a motor vehicle over an area covered by German shellfire after all other means of communication had been broken, receiving a citation for bravery and meritorious work. On another occasion he was awarded a Silver Star and promotion to first lieutenant for his part in unsnarling a traffic tie up while under heavy German fire. He also received a shrapnel wound to his hand which earned him a Purple Heart. By late March, Lt. Avery was at a rest camp, enjoying a well-earned break from combat. But pretty soon he was back in the front line and the newly promoted captain was aiding the final push against the Germans. 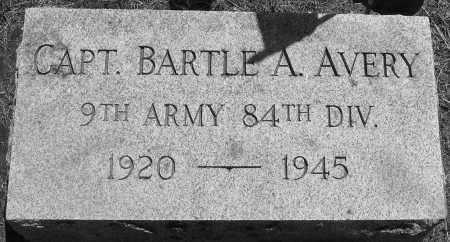 On April 6, 1945, just days after receiving promotion to Major, 25-year-old Bartle Avery was killed in action. A Requiem Mass was held for Avery at Trinity Church in Gloversville, on April 23, 1945 – the church where he and Ellen had married 17 months earlier. This church later commissioned stained glass windows in memory of both Avery boys. After the war, both Milton and Bartle Avery's bodies were returned to the United States and rest at Ferndale Cemetery in Fulton County, New York. During the 1960s the Gloversville Pop Warner-sanctioned football program was named the Wemple-Avery Football League in honor of Bart Avery and Don Wemple, another local athlete killed in WWII.